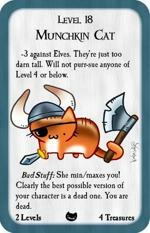 When I was tasked with writing Munchkin Kittens, I knew I'd need to become an expert on felines in order to deliver the very best quality Munchkin jokes. I headed out into the savannah to truly become one with the cats there. This was a terrible mistake. They're very big, horribly fast, and I was just food to them. After being chased down, maimed a little, partially-eaten, and just generally batted about, I escaped back home . 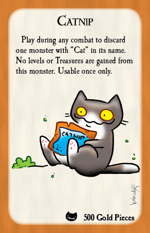 . . where I managed to lose a staring contest to my friend's twelve-pound Siamese. The lesson I learned was that cats are jerks. No matter the size or the location. 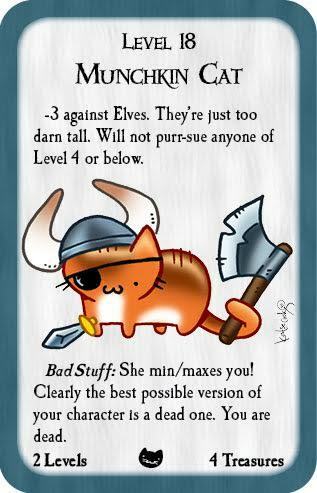 When you run into one of the Munchkin Kittens in a dungeon, like this Munchkin Cat card, my advice is to throw them some Catnip and run the other way.